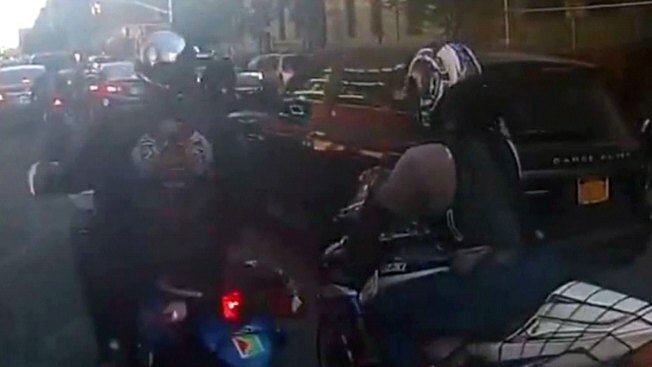 Police say a large group of motorcycle riders attacked and beat a 33-year-old father who was driving in Manhattan with his wife and 2-year-old daughter on Sunday. The dispute began when the family called 911 to report the bikers driving erratically on the West Side Highway, police said. The bikers were in town for an event called Hollywood Stuntz, where motorcyclists drive around Manhattan doing tricks, according to officials. The dad then hit one of the motorcycles, and the others surrounded him and started hitting his Range Rover and slashing his tires, police said. The family then sped off, apparently striking some bikers, who chased them, police said. At one point, a biker got off his motorcycle and opened the driver's side door of the SUV, before the dad sped off again. Part of the ride and fight were captured on video. The family exited the parkway near 178th Street and the group surrounded the vehicle. One rider began smashing the driver's side window of the SUV with his helmet, while another tried punching a window with his fist. The dad was pulled out of the car and beaten, Kelly said. He suffered black eyes and other injuries. Police have arrested 15 people and seized 55 motorcycles in connection with the stunt event. No one has been arrested for the fight with the SUV driver.